I’m beyond excited about our February 20th show at Harlow’s with L.A. rockabilly legends The Blasters! 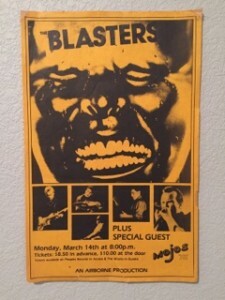 I first saw The Blasters on Monday, March 14, 1983 at Mojos in Arcata, California. Don’t look for the club cuz it’s long gone. But The Blasters are still rockin’ and rollin’ their signature American music. Back in 1983 I was a senior in high school and wrote for our school paper. We were the Eureka High School Loggers so our paper was called the Redwood Bark! 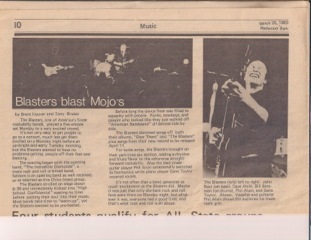 My buddies Rob, Ken, Brent, and I all got into the show free cuz we were “press” and “needed” to review The Blasters. Mojos was such a cool club that way! Over the years we saw and reviewed tons of bands like X, The Dead Kennedys, DOA, Los Lobos, The Circle Jerks…but I digress. Monday, March 14, 1983… 12:24 AM. I went to see The Blasters tonight! They were GREAT! I got a t-shirt and a song list. I didn’t start dancing till towards the end. I danced with this one girl…I don’t know who she was but she was cute! Well I have a big anatomy test tomorrow so off to bed! I got a B on my anatomy test…I studied so hard at The Blasters!!! Later that week Brent (all-around good guy and part-time drummer in my first band F.O.S.) and I wrote a review of the show. This week I dug through the garage and found a copy of the Bark with the review. I scanned and included it in this post for your reading pleasure! I also dusted off my Blasters albums this week. They are amazing and timeless. I also realized just how much the music and energy of The Blasters seeped into my musical soul. I can see their influence in my songs and performances with The Nickel Slots. I’m so grateful to Mojos, the Bark, and my friends for encouraging me to seek out such cool shows that would ultimately shape me as a songwriter and musician! 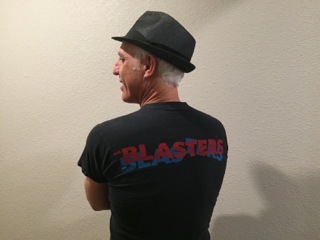 So here I am 35 years later getting ready to share the stage and some of my songs with The Blasters! Time goes by like a race horse running…time goes by, but it always comes back! A side note…F.O.S. stood for Friends of Stan. Stan was our barber and required a note from our parents if we wanted a crew cut or flattop. Kids in Humboldt County in 1983 only got those short haircuts if they were going into the Army…NOT because they wanted a cool look for their rock and roll band! My principal called my folks because he thought Stan stood for SATAN and I was one of those “devil-worshipping punk kids.” Ahhhh, the Reagan days! 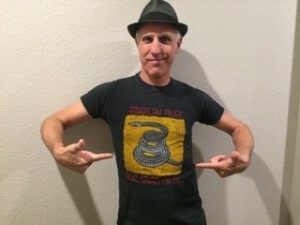 …and it sorta still fits!